The appearance of basal cell carcinoma can vary significantly, which sometimes makes it difficult for individuals to recognize that they have the disease. Thus, any non-healing or recurring sore is usually reason enough to visit a medical professional. The most prevalent form of basal cell carcinoma is nodular. The cancerous nodules may exhibit a waxy, translucent, or pearly appearance, may feature a central depression or a raised border, and may periodically bleed and crust over. In addition to the typical nodules, basal cell carcinoma can also have the appearance of bluish-gray cystic lesions, pink to red papules or scaly patches, or increased brown or black pigment, especially in dark-skinned individuals. 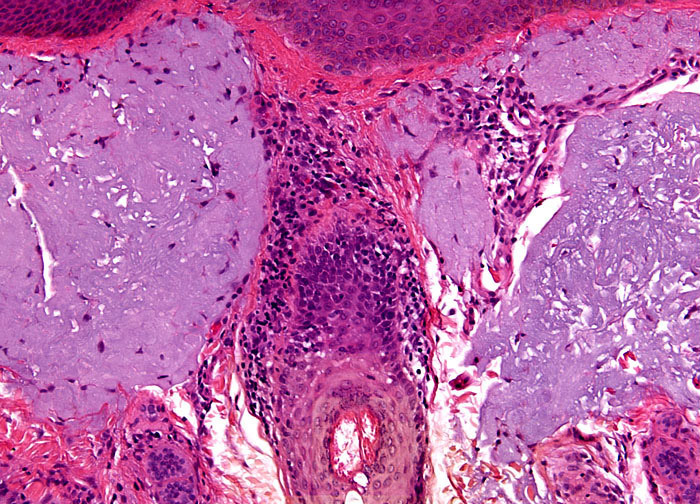 The borders of basal cell carcinomas may be either well- or poorly-defined depending on the specific type of the disease. In some instances, the cancer may be easy to confuse with scar tissue upon initial examination.